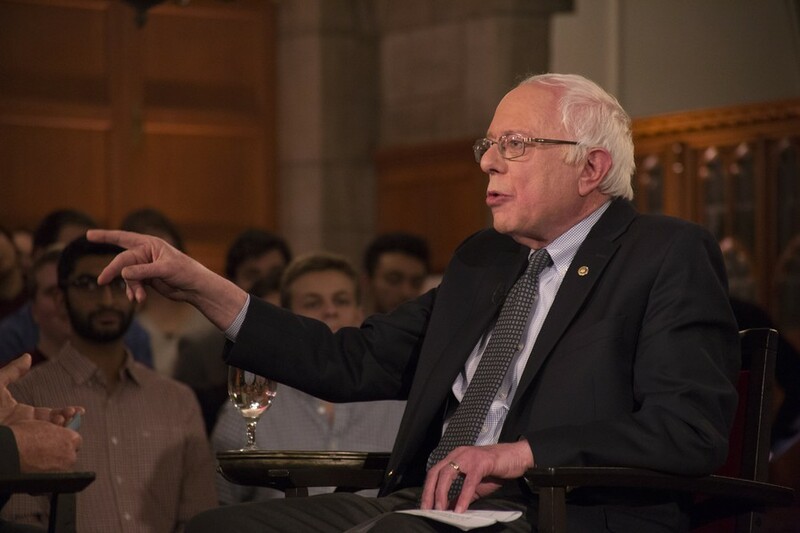 Sen. Sanders speaks at the Quadrangle Club in February, 2016 during an IOP event with Chris Matthews. U.S. Senator and University alum Bernie Sanders (D-VT) (A.B. '64) has written a letter to University president Robert Zimmer urging him to respect the result of last month's graduate student unionization election, according to a tweet from Graduate Students United. In October, graduate students voted to unionize, but the administration has stated that it intends to pursue legal action. "As an internationally prestigious institution of higher learning, I hope very much that you will set an example throughout the world by supporting a democratic decision made by graduate students and teaching assistants...." Sanders wrote. "To appeal this decision to an anti-worker, Trump-appointed National Labor Relations Board is not something that a world class institution of higher learning should do." Sanders sent a letter of support to graduate students and listed some of the benefits of unionizing before the vote last month. He listed some benefits for the University, writing that in his experience, unionized students are more invested because they have greater say in the workplace.